Original Flower EssencesFor Relief of occasional stress.Dr. 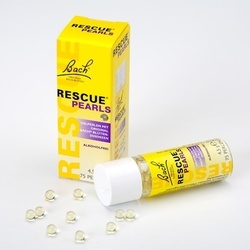 Bach's most famous Flower Essence formula, Rescue Remedy, is one of the world's best known natural stress relief remedies. Made from five of the Doctor's original 38 Flower Essences: Cherry Plum, Clematis, Impatiens, Rock Rose and Star of Bethlehem.Rescue Remedy is an all natural form of healing that can reduce everyday stress and help maintain control of your health. Effective in virtually any situation that causes stress or anxiety. Helps restore a sense of calm and control.Gentle, safe, effective treatment for the whole family.